Most businesses need a sales boost now and then, the challenge is making that happen quickly. If you are waiting for Referrals to call you, well that happens when that happens. So how can a business find sales fast using the Internet? You are going to need to advertise. It’s the only quick way to find new prospects online, which isn’t a terrible thing, as long as you have a well thought out plan, and campaign. Let’s use the number one method in the world for online advertising, Google Ad Words program. That’s when you place an ad on the Google search results for the keywords that prospects use to find your business. You can place your ad on just the Google search and partners sites, or on Google and all the Ad Sense partners they have (you know, when you see an ad for a business on a site you are viewing, not a Search engine? Those ads are placed (in many cases) through the Google Ad Sense program. 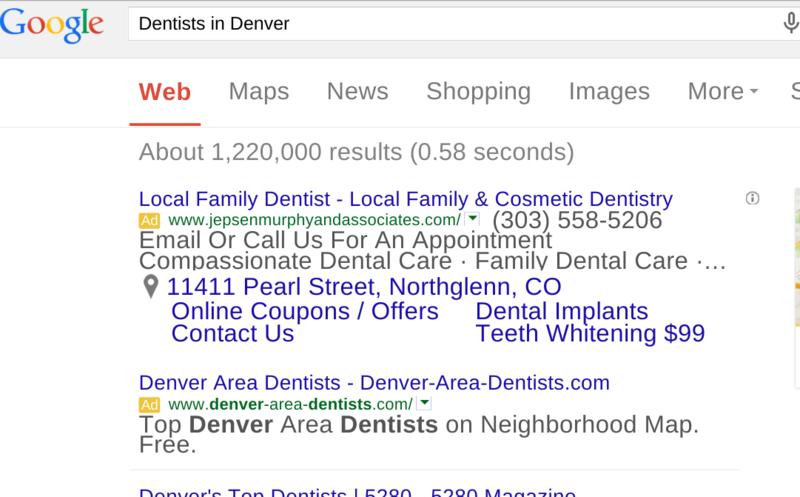 Here is what a normal Google Ad Words ad looks like on a search result page for someone search for a Dentist in Denver. 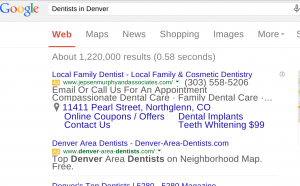 Your ad is placed on the search result page according to three basic criteria. The amount you are willing to pay for someone to click on your ad compared to the other advertisers, the relevancy of the ad to the keyword search, and the relevancy of your ad to the page the search leads to on your site (called a landing page, this doesn’t need to be a home page). Google is a very powerful lead generation source for many businesses. So here are the steps to get started and have an ad showing in one day. Develop your budget. For bigger ticket sales assume a 20% cost of sale based on your Gross Margin for the advertising if you have no other metric to use. So if you sell a $40,000 item, your gross is $6,000. You should assume you will pay $1200. for one sale. Yes, that may sound expensive, and its only a rule of thumb. You may do significantly better, or if you can lose money on advertising if you are not careful. Develop a landing page where your prospects will “land” when they click on your ad. There is a ton of information online about how to build a great landing page. Sometimes you already have this page on your site and you won’t have to change a thing. Or you can start with a home page as you build a better landing page. In a great ad words program you might end up with 10 or more landing pages designed for specific type searches, but for right now, lets get this program running! Have a plan on how you will respond to each inquire. They may contact you through your contact form, or call. Be prepared to answer the call, or call then as soon as possible from a contact form inquire. You may want to write a script for yourself or the person answering the calls with the qualifying questions you want to ask. Have a calendar ready to schedule an appointment. Track all your results. With any advertising, you need to understand what is working, and what doesn’t. You need to plan to spend some money on the learning process as you understand what keywords pay off, and which ones are a money pit. Good idea to have Google analytics on your site. And make sure you monitor your Ad Words program daily for the first 30 days. Okay, it may sound overwhelming, but many small businesses do this on there own. If you are in a hurry, or just feel more comfortable letting an experience company manage this for you, please call us for a free assessment of how this would work for your business. Previous PostPurchase Guide to AdvertisingNext PostGoogle to start indexing chat conversations? Really effective steps. I never focus on these pints. Thanks… It is very important steps for my eCommerce site.